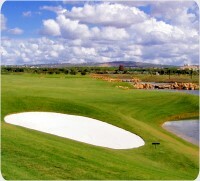 The Victoria Course is one of the newest courses to be opened in the Algarve. The holes have been laid out over virtually flat terrain which has been then reconstructed to provide an undulating surface. 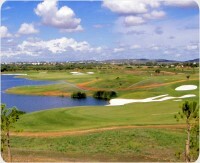 A series of waterfalls into lakes create visual attraction to players beside providing an agreeable background sound. 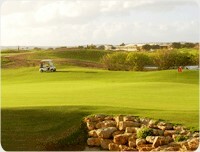 It is at present the longest 18 holes golf course in Portugal. Each hole has been designed to give the player a choice of five tees to play off so as to make it suitable for golfers of all handicap levels. Via Infante (A22) - Take Boliqueime Exit-11 and head south until you reach the first roundabout with traffic lights. Turn east onto the Road EN 125 to Vilamoura and continue for about 4 kms until next traffic lights. Here you bear to the right into Vilamoura and continue until the third roundabout. Turn right and when you reach the second roundabout turn to the left. Continue south for about 500 metres and the entrance to the Club House is on the right side of this road.